Former Associated Student Government president and Weinberg senior Noah Star (left) swears in the new president, SESP junior Christina Cilento, and executive vice president Macs Vinson, a McCormick junior. Star told senators in a farewell address to take their jobs seriously and represent students well. 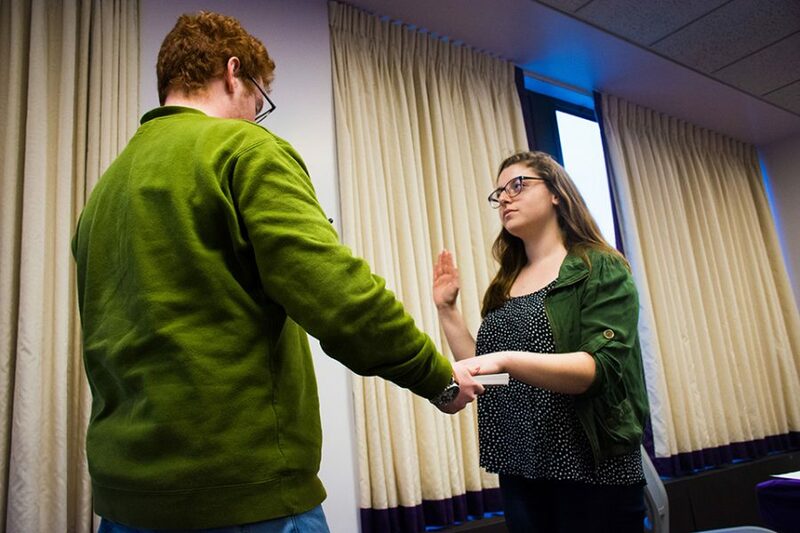 SESP junior Christina Cilento and McCormick junior Macs Vinson were sworn into office Wednesday as president and executive vice president, respectively, at Associated Student Government Senate. Outgoing president and Weinberg senior Noah Star gave closing remarks after swearing them in. Star emphasized lessons he learned during his time as president, speaker of the Senate and a senator. He said although his job wasn’t easy, he learned about cooperation and teamwork, comparing Northwestern to a campsite that he wanted to leave nicer than how he found it. For Cilento’s oath, Star used the book “My First Summer in the Sierra” by John Muir, a nod to her work as the vice president for sustainability for two years and as a member of the divestment group Fossil Free NU. Later in the meeting, senators were elected to fill two committees: the selection committee, which will choose some vice presidents, and the rules committee, which ensures senators are following ASG code and the Constitution. Two senators were elected from three nominations to fill the selection committee. Ben Powell, a SESP freshman, and Justine Kim, a Weinberg freshman, will join six other members of ASG, including the president and executive vice president in deciding eight new vice presidents. “Part of the responsibility of the selection committee is not just to assess technical qualification, but also to really think, ‘What do we want ASG to do, and who do we think can carry out that work?’” Powell said. Three senators were also elected to be on the rules committee. Three other senators were elected in Fall Quarter. Out of four nominations, Weinberg sophomore Daniella Lumpkin, McCormick junior Natalie Ward and Weinberg freshman Tomer Cherki were chosen. Cherki cited his experience leading discussions with Global Engagement Summit and his studies as a philosophy major as reasons he is qualified to be part of the committee, which involves learning the code and constitution. Next week, there will be an open forum at 6 p.m. before Senate to allow students to learn more about the appointment of Karl Eikenberry as the executive director of the Buffett Institute for Global Studies. Last week, a vote on a resolution calling for the rescindment of his appointment was tabled after senators said the debate contained factual inaccuracies and needed more time for consideration. In addition, B-status spring supplementary funding was presented by vice president for B-status finances Kassandra Blanchard, a Weinberg junior. Senators will vote on the recommendations of the funds next week.